Lovers, to your left prepare to swoon over the ravishing Rebecca Taylor Striped Sailor Tee; to the right allow your kohl-rimmed peepers to take in Talbots’ tantalizing French Fair Stripe Tee. Though the Talbots creation lacks the ribbon-tie back of the Taylor pretty; for a mere $39.50, in comparison to the $145.00 of its haute couture counterpart, it is every bit as capable of providing the frugalista’s wardrobe with a smidgen of natty nautical-ness, at a price that gives one the chance to splurge on all three shades (Navy/Ivory, Tangerine Frost/Ivory, and Pink Sand/Ivory)! Tell me, kittens…will you be a big spender and go for Rebecca Taylor, or be thrifty and spring for Talbots? Thanks to Neiman Marcus and Talbots for the pictures. 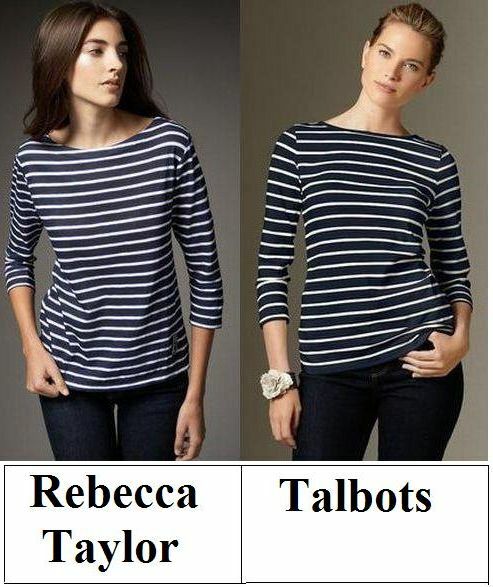 They're both so similar, I'd go with Talbots. That's a great tee, i would buy it:) But the 40$ one, not the 145.00! Its easy to pay for haute Couture and look amazing or at least feel it, but the real skill is getting the haute couture look and still have the same/similar look, don't you think? so the best choice would the Rebecca Taylor Striped Taylor Tee... in my humble opinion of course! I love both of these tops but would definitely opt for the cheaper on this type of item. That's a wonderful price from Talbots. The T to have, I'm sure. Love it in that Tangerine & Pink too! Oh, what a great trend. I'll probably have to wait on this. One, I just don't wear stripes. But its really a cool T. Thank goodness for Talbot. Classic stripes - I'd definitely go for the Talbot's one! The cheaper one, most definitely. This is a current trend piece! Lovely! I like the way the Talbot one fits. I like the Talbot's, I like the neckline better on it. I like the way the Rebecca Taylor tee hangs, but for something so basic--a striped tee--I'd opt for the Talbots version. i'd go for the talbots one! Stripes are my favourite trend! I have so many. I love the Rebecca Talor one. it looks more nautical. Too cute!! Perfect top for a pair of jeans. They look similar but I'd get the Talbots shirt. I love a good stripe tee. They never go out of style. Talbots is great quality so I would go for it. This is the perfect post, as I have already started amassing the necessary nautical pieces that are needed for this Spring's attire! I am all over the Talbot top. You can barely see the difference. Good find! The cheaper one for sure. No one will know! I think it's so easy to find a striped tee that you really needn't spend too much on one. I might look for one with relatively nice fabric, but I wouldn't be willing to spend too much. As much as I love Rebecca Taylor, I'd have to go for Talbots on this one. They are identical! stripes have been the rage in recent months. I like the more frugal option given these looks are very similar and the Talbots option is more economical. great finds, Erika. I'd snag the Talbots one; the price is way more reasonable! I prefer the cheaper one because if I buy the cheap one I'll be able to shop more. Totally great T. Cool that you can get it at Talbots. I want! Who would have thought Talbots would be so stylish? What a perfect match! And so springy -- bravo, my dear! I cannot stop wearing all my striped tops right now and these are so cute. I'd definitely go for the cheaper one! I think I prefer the Talbots. The Talbots pretty will do just fine! Talbots - it's crazy how similar both of these tops look!